The namesake of the famous Spanish wine was the city of Jerez de la Frontera in the province of Cádiz ( Andalusia ), which has been a center of wine, liqueur and brandy production since the Middle Ages. In 711 came Spain under Arab rule, but despite the Islamic alcohol ban Wine was still produced. Caliph Alhaken II. Decided in 966 that clear the vines, but the locals successfully argued that some of the grapes too raisins processed by the Muslims in their campaigns. Therefore, only a third of the vines were destroyed. Already in the 12th century sent the Spanish winemakers Sherry to England and received in return English wool. During this time, the wine got its name, derived from the Arabic name of the city "Sherish" or "Xeris". He was considered at that time as one of the best wines in the world. The conquest by the Castilian King Alfonso X (1221-1284) in 1264 brought Jerez back under Christian rule. The Christians said before a battle, allegedly, even to drink their horses from the wine to break these. In 1483, the city fathers of Jerez issued the first statutory regulation for the production of sherry, the detailed instructions for vintage, Texture of leathery wineskins, the expansion and commercial practices. Sherry was well suited for long voyages because of its durability. For example, in 1519, the Portuguese navigator Ferñao de Magellan (1480-1521) bought 417 hoses and 253 kegs of sherry before embarking on his world tour. In 1587, the English buccaneer Sir Francis Drake (1540-1596) attacked the city of Spanish city Cádiz and robbed 2,900 barrels of sherry, which made London enjoy this wine. This very quickly became immensely popular and an English fashion drink. William Shakespeare (1564-1616) was an absolute sherry fan, he daily approved a considerable amount of money in his favorite place "Bear Head Tavern". Again and again this wine was mentioned by name in scenes of his works (Richard III., Henry IV, The Merry Wives of Windsor and Henry IV.). In this context, Shakespeare - and the sherry - also on the naming of the sparkling wine (see there) involved. In the 19th century, Spanish companies settled in Jerez, some still exist today by name. 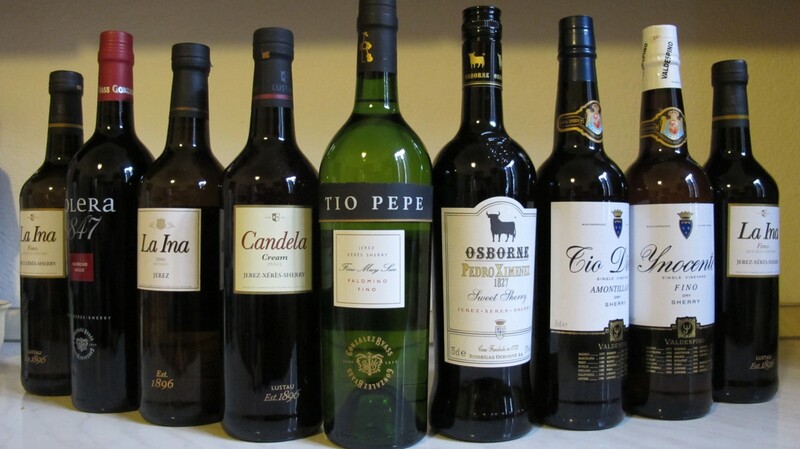 All over the world, wines were produced under the name sherry, the brand or name was only in 1996 in the EU protected. The vineyards in the DO area Jerez full name "Jerez / Xérèz / Sherry and Manzanilla de Sanlúcar Barrameda" cover approximately 10,500 hectares. The vineyards are largely in the direction of the Atlantic Ocean. Earlier at all soil types Vines planted, today almost exclusively only on the bright white chalk ground albariza (lat. alba = white). This floor is the sherry's first secret of success next to climate. varieties and the long experience of the winemakers. The planting of the vines takes place in rows (liños), which are aligned in north-south direction. This will give you maximum sunshine throughout the day. The most important grape variety is Listán ( Palomino ), with about 90% of the production area the sherry vine par excellence. It contributes to the special character of the sherry. In addition, there are still small stocks of varieties Muscat d'Alexandrie (especially in the area of Chipiona) and Pedro Ximénez cultivated, which are mainly used for sweetening special sherry varieties. For the beginning of reading is the Sugar- and acidity the grapes crucial. The vintage usually done by hand; the grapes are collected in baskets ("arrobas" 11.5 kg each) so that they are not damaged. Exactly 62 of the baskets make one Carretada, the required amount of grapes for 500 liters of must. The sweet-grape grapes are exposed to the sun during the day to increase the sugar content of Esparto grass mats, further reducing the already low acidity, and covered at night to prevent them from being damaged in the damp, cool night air. This sun treatment lasts at least 48 hours. In a traditional process, the grapes are still before pressing Yeso (Gypsum) added. Usually one already decides when squeezing which type of sherry is to be produced from the material. The fermentation Usually takes place in steel containers with up to 40,000 liters at temperatures between 22 and 24 ° C. Some bodegas use the fermentation in new oak barrels (Botas or Barricas). At the end of the fermentation it is decided which wine is suitable for which type of sherry. Each barrel is checked and classified by Capataz (Butler). 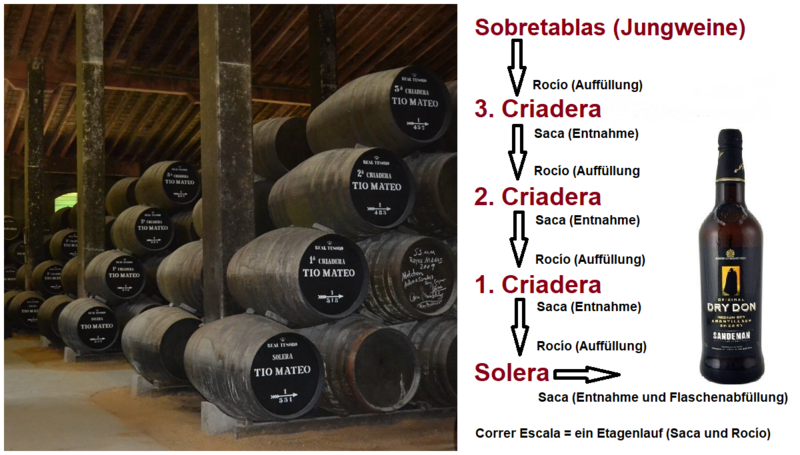 The barrels are marked with oblique chalk marks (raya = stroke or stripe, or also palo = stick, see Palo Cortado) in four categories according to their value. This coding is slightly different depending on the bodega. A dash (una raya) is awarded for fine, elegant wines that give a good Flora sentence expect for Finos, Manzanillas and later Amontillados. Two strokes (dos rayas) receive full-bodied wines, where no Floransatz is to be expected and which are therefore provided for Olorosos. Three lines (tres rayas) receive all wines whose development can not be ignored and which are therefore classified again after a few weeks. The inferior wines with sour, rough taste get four strokes (cuatro rayas) and are for distillation or the production of vinegar certainly. The wines of the first three groups are now left to themselves. A second evaluation takes place after at least nine months, where the sherry types are finally determined. The wines of the first group are aufgespritet to about 15% vol alcohol content (Encabezado) and mature in oak barrels with about 600 liters of content. The barrels are filled to five-sixths, so that forms an air chamber of two hands wide, the growth of the very important Flors allows. The spontaneous formation of yeasts on the wine surface prevents the oxidation with the types Fino and Manzanilla. This layer isolates the wine from the air, deprives it of alcohol and gives it typical flavors. The storage in warehouses on the ground floor is a characteristic of the expansion, whereby the constant draft through the openings of the halls makes this possible. The modern warehouses are today air conditioned for this purpose. The barrel volume has a close and important connection with the florhep layer. The pile removes alcohol from the wine and liquid is lost through the barrel wall. Due to the volume and the surface, however, the alcohol content always remains the same. If one were to use smaller or larger barrels, the balance would be disturbed and the flor yeast would die off, since it only forms between 14.5 and 16% vol. The second wine group is sprayed up to 17.5% vol, thereby preventing the formation of piles. By filling in the barrels begins under oxygen influence the maturation process, from which emerge the wines referred to as Oloroso. The aging and blending technique for sherry is usually called "Solera" or "Criadera-Solera". Strictly speaking, Solera refers to the lowest row of caskets (from suelo = ground) with the oldest wine. This technique makes sherry something special. Traditionally, sherry ripens in superimposed barrels (escalas) of the same type but with different maturity stages. In the bottom row is the oldest and in the top row the youngest wine. Regularly takes the lowest row up to a third of sherry for consumption. This is called "Saca" (removal). This quantity is replaced by the next row, the so-called "criadera" (breeding or deposit), which in turn is filled up from the next higher position, until finally the top row of young wine from the Sobretablas or Añadas system is filled up. The filling on a barrel row is called "Rocío". This mixes all existing years with each other. The withdrawals and refills in the various rows are called "Correr Escalas" (floor plan). The mixture of wines, which is also referred to as "Trasiegos" must be done very carefully. There is a special staff for this, the "Trasegadors" (refillers). These work with their own technical devices, with which, for example, the homogenization of the wine takes place. Neither the Hefeschelier nor the "Cabezuelas" (drum deposits) may be whirled up. The characteristics of the older wines are transferred to the younger ones, so that quality and type always remain almost the same. Most sherries go through six to seven, in extreme cases to 14 solera stages. Today, the barrels are often no longer in the classical form of each other, but in different groups, sometimes in different bodegas. For the producers, both the amount of extracted wine and the time of collection are determined according to the sherry type and closely guarded secret of the houses. The average aging time for a wine is determined by the quotient that results when the total stock of wine in the system is divided by the amount of annual withdrawal. According to the requirements of the Control Council, this quotient must be greater than two. Only wines with at least two-year aging may be marketed. The Soleras exquisite sherries are filled only with wines of the best vintages and harvests, so that in bad years (without refilling with new wine) from the lowest barrels no sherry can be bottled. Generally, sherry's minimum maturity is three years, an amontillado less than seven is almost impossible, and sophisticated brands mature to 15 years or more. When the finos slowly lose their pile, a new ripening process can be added to the biological aging under Flor. It is first converted into Fino-Amontillado and then in Amontillado. In Manzanilla, this process begins with the Manzanilla Pasada, which eventually transforms into Amontillado. The range of many sherry species ranges from light to dark and from dry to sweet. Regarding color, the rule is: the lighter, the drier - the darker, the sweeter. The sherry is always a white wine; There is no Tinto variety (red wine), although the color can be very dark. There are basically three types of sherry. These are, firstly, Fino and Manzanilla , matured without oxygen under Flor, and Amontillado , which ripens under oxidation, and secondly, Oloroso , which has ripened under the influence of oxygen, and, thirdly, Palo Cortado, which is in the taste between Amontillado and Oloroso. Fino: The classic bone-dry sherry with a light, golden yellow color and a typical almond flavor, which is relatively young when compared to the other types. In Sanlúcar de Barrameda he is called Manzanilla (see below). The grapes are mostly from the lower, cooler areas. It matures under a thick pile layer without oxidative influence. The alcohol content is between 15 to 18% vol. A Fino is the basis or precursor for the two variants Amontillado and Palo Cortado. As described above, but from a originally intended as Fino wine over the years still be an Oloroso when the pile layer dies of itself and the wine has a fragrant (oloroso) character. Amontillado: This body-richest and most taste-intensive Fino variant develops initially under pile; At this stage the wine is a fino. By sprinkling over 16% vol alcohol or blending with an old fino, the flor yeast dies and it will go through an oxidation phase. After maturing for 12 to 15 years he is called Fino-Amontillado , after more than 15 years he is called Amontillado. The color develops depending on the aging of dark gold over light brown to a blackish brown. The delicate and spicy aroma is reminiscent of hazelnuts. A real Amontillado is completely dry. However, there are also semi-sweet products of inferior quality that are blended from Rayas and sweet wines. The alcohol content is between 16 to 22% vol. Manzanilla: This pale yellow Fino variety is also referred to as "Señorita among the Sherry". It matures under Flor and comes exclusively from the area Sanlúcar de Barrameda at the mouth of the river Guadalquivir. Due to the prevailing strong Atlantic winds here, the wine has a typical, slightly salty and slightly bitter taste. Because of the humid and cool air in the summer, the yeasts last all year and, unlike Jerez, there is far less danger of the pile layer dying. First he is called Manzanilla-Fina and after further maturation Manzanilla-Pasada . The alcohol content is between 15 and 19% vol. The name derives from "manzana" (apple), which means freshness. A second variant calls as origin "manzanilla" (chamomile), because the wine has the typical smell. Oloroso: This main variant arises without a pile layer under oxidative influence. The Oloroso is darker, fuller and stronger in flavor than the types Fino and Amontillado. The dry, Amber- To mahogany wine has a pronounced, fragrant nut flavor (oloroso = fragrant). It is one of the most durable wines with an incredible shelf life of 50 to 100 years. The alcohol content is between 17 to 22% vol. Palo Cortado: This variant can (allegedly) not be produced selectively, only about a barrel under a thousand becomes under uncontrollable conditions the Palo Cortado. That's the official name. However, in the annual quantities of many producers on the market, one must doubt this legendary explanation. Palo means "stick" or, analogously, "thick line". With thick strokes (rayas or palos), the barrels are marked according to their quality (see above). A Palo Cortado arises from a quality originally intended as Amontillado. If suddenly in a barrel the bloom yeast dies and it comes to a premature intensive oxygen contact, the wine can not become due to the missing Florhefe no more to the Amontillado. But a purebred Oloroso is no longer possible, since the wine has begun as Amontillado. With appropriate suitability, such a wine is provided only at this time by examining the cellar master as Palo Cortado. The "palos" (strokes) are crossed out, in the figurative sense "cut off". This gives the meaning of Palo Cortado = "truncated stick". Now he is going through a longer one oxidative Process. The mostly dry wine has the hazelnut-like scent of an Amontillado and the taste or body of an Oloroso. The alcohol content is between 18 and 20% vol. But there are also sweet variants. Cream: This type was created especially for the northern European taste, in Spain it is not very popular. The sweet-aged, dark wine ripens without a pile layer with oxidative influence. It is a blend of Oloroso with sweet wine (Dulce). Simple creams use a sugar solution or must, with better creams arrope (thickened grape must) from Pedro Ximénez and at the best Creams (then Amoroso) long Solera-matured Pedro-Ximénez-Sherrys. The alcohol content is 15.5 to 22% vol. Golden: More similar to Cream, milder and slightly sweet guy. The alcohol content is around 15% vol. Medium Dry: A semi-dry, mahogany wine with a spicy aroma. It is an Amontillado blend of young, sweet wines. The alcohol content is 15 to 22% vol. Pale Cream: A sweet Fino variety with a pale color (pale) and spicy aroma. The alcohol content is between 15.5 to 22% vol. Pedro Ximénez = PX: A sweet variant of the same grape variety, sometimes called " Trockenbeerenauslese "Is referred to as the sherry. The grapes are exposed to the sun and lose moisture. An old PX sherry is almost syrupy and of a dark brown color with intense aromas of dried plums and raisins. The alcohol content is between 15 and 22% vol. Very old sherys receive a certificate of age on the back label ( VORS = 30 years and VOS = 20 years). In Spain the sherry is drunk from special glasses. The tulip-shaped Catavino tapers up and captures the bouquet. Traditionally, the sherry with the Venencia (Silver cup on a long rod) taken from the barrel and poured in a high arc unerringly into the glass. The Fino variants and Manzanilla should be well chilled, the other sherries should be served slightly chilled. Sherry bottles should in principle be kept upright (without cork contact) as well as dry and dark. Open bottles must be corked again. Well-known sherry producers and trading companies are Tomás Abad, Herederos de Argueso, Antonio Barbadillo, Agustin Blázquez, Bobadilla, Bodegas Internacionales, González Byass, Luis Caballero, Croft. Domecq, El Maestro Sierra, José Estevez, Jesús Ferris, Garvey, Hidalgo La Gitana, La Guita, Harvey's. Emilio Hidalgo, M. Gil Luque, Lustau Marqués del Real Tesoro, Hijos de Rainera Pérez Marín, José Medina, Los Infantes de Orleans-Borbón, Osborne. Paternina, César Florido Romero, Pedro Romero, Sánchez Romate. Sandeman, Terry, Valdespino, Valdivia, Williams & Humbert, Delgado Zuleta and Don Zoilo. Most producers also produce one Brandy de Jerez, Small, private sherry farms are using the protected name Almacenista designated. This page was last modified at 17 April 2019 at 18:22.